Everyone loves a two-for-one. 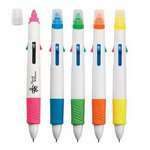 Well, how about a four-for-one, like the Quatro logo pen with highlighter? 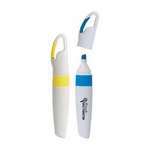 This neat little tool offers four ink colors with a highlighter on top and matching grip. Plus, we carry it in five different highlighter colors, so you can get exactly what you want, and then print your logo on the clean white side! Not only does it write, but it's a pocket tool and stylus. 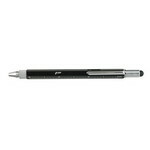 Show off your logo on this handy Multi-Function Stylus Pen with Screwdriver for a unique giveaway. Customize the Ballpoint Lumina Stylus Pen with Light with your personalized business logo and make a lasting impression at your next corporate company event! No study session is complete without taking notes and highlighting important points. It is tiresome to switch between a pen and a highlighter during last minute revisions. No study session is complete without taking notes and highlighting important points. It is tiresome to switch between a pen and a highlighter during critical note taking sessions. Efficiently accent important texts in your documents and books, using the stylish Carabiner Highlighter. This chisel tip highlighter contains fade resistant ink, which will ensure that the highlighted sections don’t lose their color over time. The Collins LED Stylus features bright LED light and stylus and creates impressive Business Giveaways with your corporate logo. 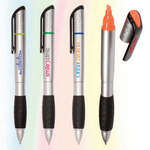 Our Ellis LED Stylus features stylus and LED light and creates impressive Logo’d Pens with your company logo. 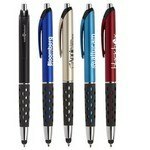 This custom ballpoint pen features a sleek design with a smooth writing ballpoint and a single logo imprint. Mr. Highlighter is a cute and useful highlighter, which consists of 4 colorful highlighters including: pink, yellow, blue, and green, as its hands and feet and a useful computer sweeper on top of its smiley face as hair, which can be used to clean your computer. 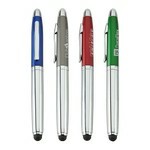 The Nashoba Torch retractable ballpoint pen features a sleek color design and comfort grip barrel for writing ease.